Preparing for a cosplay is never easy, especially for first-timers like us. Marc (my boyfriend) and I "debuted" our first-ever cosplay last June 18 at the 10th Philippine Toycon in Megamall---and it was a blast! 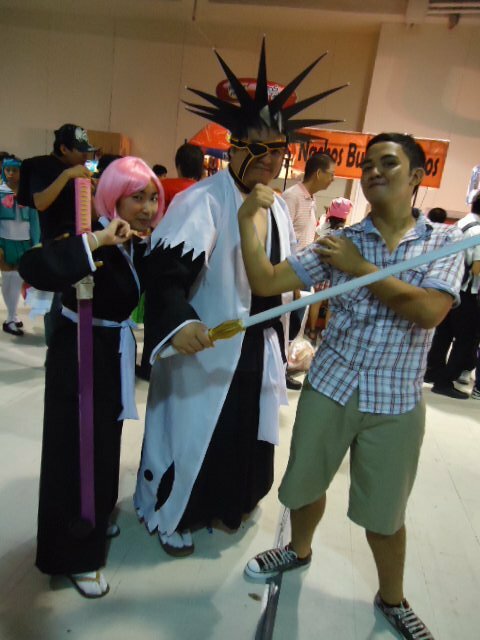 Kenpachi is the Captain of the squad who has a wild and aggressive appearance that fits his personality. His love for fighting is shown a lot in the series. Yachiru is his Lieutenant and is the total opposite of him, as she is known to have child-like personalities such as being small, cheerful and carefree. Both Kenpachi and Yachiru's personalities are what makes this pair so unusual, unique and easy to remember by "Bleach" fans. 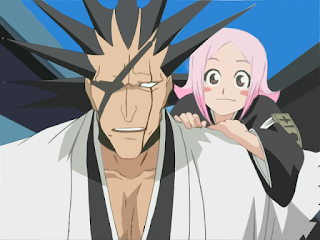 Kenpachi is Marc's favorite "Bleach" character because of his personality, while Yachiru is one of my favorites because she's so cute and fun to watch. 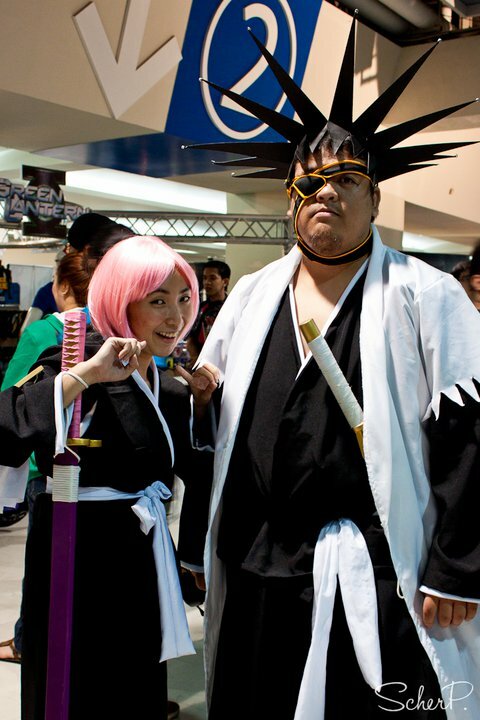 And since both our builts suit these characters, our decision to cosplay them was final by the end of 2010. We knew cosplaying Kenpachi and Yachiru is not easy so we decided to "debut" them on Toycon 2011 to give us more time with the planning and creating everything. Last December 2010, I had Kenpachi's Captain Coat made by a dressmaker in Marikina and gave it as a Christmas gift to Marc ---and then everything went on from there. The first thing we did was the weapons and contacted Animeniacz Online for it around last week of April and got it after two weeks. 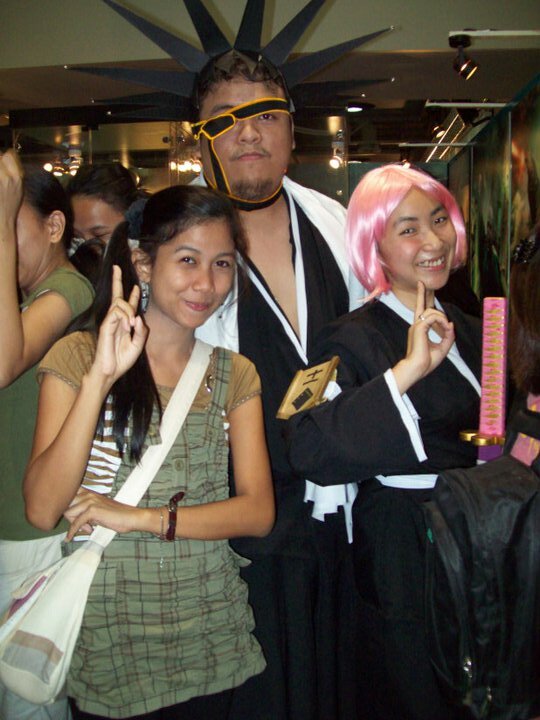 Then we had the rest of the costumes made by 2nd week of May, bought the pink wig, made Kenpachi's hair, and had the eyepatch done. And of course, we also studied our characters to the fact that I made Kenpachi and Yachiru my desktop wallpaper. Finally, Toycon 2011 arrived and we were quite excited to cosplay then. Well, I think I was more excited than Marc because I just had 3 hours of sleep after work and was even the first one up :) We arrived in Megamall at around 3:30pm and immediately bought a ticket. Here's the funny part: one of the things I wanted to see in the Toycon is the Harry Potter props and costumes that came from the movie set itself. So we went there, but never got the chance to see it all because people were already taking pictures of us---in the Harry Potter movie booth! We felt kind of guilty because costumed Dumbledore and Bellatrix were there. So after some people took our pictures, we walked around and finally found a spot where we could just be steady. And that's when it became overwhelming for me. I know that people take a lot of pictures of the cosplayers, but I didn't expect it to be overwhelming. In fact, I didn't know what to expect (while Marc already knew what to expect) that I was a bit shocked on people taking our pictures every second and minute. 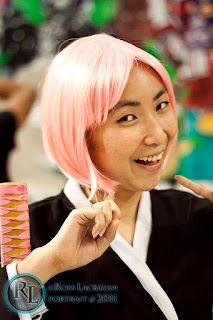 Come on, it was my first time to cosplay and I REALLY didn't know what to expect. So, thus the shock. Despite that and being tired at the end of the day, we enjoyed cosplaying for the first time. We met some people and even saw some friends we haven't seen in a long time. It was a memorable and enjoyable experience that we would never think twice of doing it again. After that, we knew this won't be the last time we'll be cosplaying. We stayed there until past 9pm as we also did some little shopping and took some pictures of other cosplayers as well. Marc and I are already thinking of other unique (and not very overplayed) characters that we'd like to cosplay, and we're pretty much excited for it. Especially me. :D It has been a fun and wonderful experience, and everything (money, time, energy, effort, lack of sleep, etc.) became worth it after cosplaying---especially when we look at the pictures. Kenpachi Wig: I made it myself! :D Took me more than six hours to finish it. OMG! I saw you guys when people were taking pictures of you! Love the costumes...you and your BF looked kulet and cool! Hahaha...I think that's okay. Age does not matter when it comes to cosplay, right? Thanks for the compliment! Hehehe...we plan to come out more in the next events. 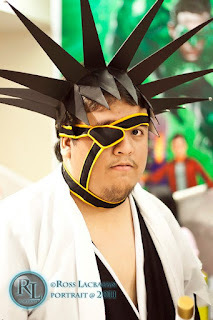 I want to see you cosplay too. I'm sure you can do it and I'm looking forward to it.